I never really thought about posting here for the big tire truck, because it's just gonna be a truck with big tires for farm use. No pretty paint job (probably paint in primer gray and scotch brite it smooth), no big performance enhancements outside of intake carb and headers. Just a good ole farm truck. But if ya'll want pics other than the one or 2 I posted long ago, I'll do it. I got the trans in today w/o help (remember 35" tires and a 2" body lift kit.) Motorcycle lift jack from Harbour Freight is da bomb, all of ya oughtta have one! It's all bolted together back to and including the crossmember. I found a spare 2.77 low gear kit in my spare parts bin and put it in before installing the trans too. That oughtta help this elephant! Convertor (11" hemi type) is bolted into place too, (will chase out the distributor alignment towards fire up time.) Tomorrow I plan to finish bolting the rest of the driveline in place. I'm no hurry, got plenty of time. I also put a battery, 1.75 amp trickle charger, in place tonight too. Also check and refill all fluids, (the rear end leaks and is empty, I know that). Get up early Tuesday and get it lit up!!!!! Still with the factory 2 bbl and ex manifolds. When all is well and tuned out, then I'll put on the performer intake I got from 270 SE an the holley 4160 600cfm carb, then the MSD 6A i got from cranky, and the flowtech headers I got from Jeg. I still have 4.10 gears under the bench for it too, runnin outta time to get them in before winter, but if the 3.55's go bad, I'll do them before next spring like I had planned, and install the WARN lock out hubs too. I DO have a locker for the rear gears when I do them too. If ya'll want build pics of something like this, say so and I'll post some. I just seem to build lower cost things than most of you and didn't figure you'd wanna see that kinda stuff. One man's trash, another man's treasure. Sure not my treasure, but it's entertainment until the treasure gets here. Curt I'm all bout doin things yourself with little coin (more of a necessity) than just paying somebody else to do it for me.......good or bad post them up brother. I used to play with the big tire trucks. 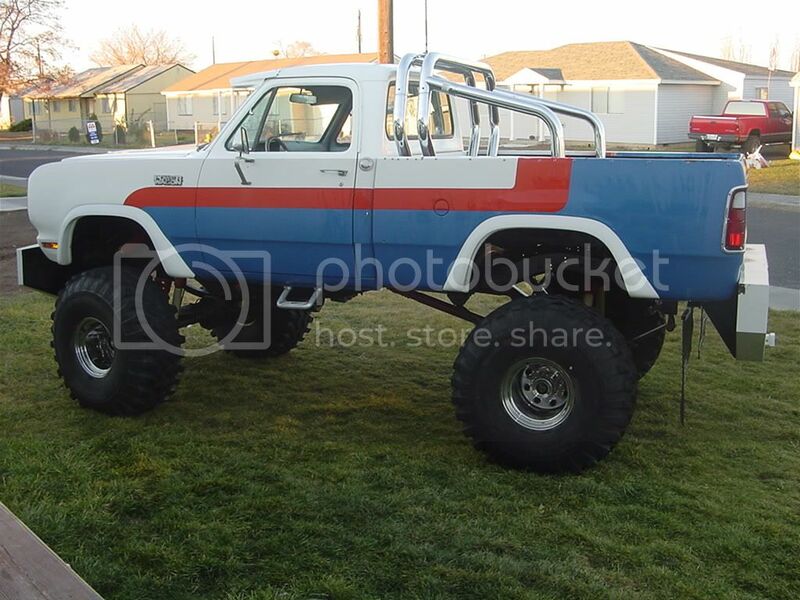 Had a lift kit and 35" Ground Hawgs on my 78' Ford way back in 1979 or 80' - before it was even popular. Owned 4-5 of them over the years from straight front axles to independents. 3.55 gears are marginal with 35-36" tires, unless you have some strong torquey motor. Low range for off road hides a lot of problem but the start and stop on road in high gear can take it's toll after awhile. I would put those 4.10s in..
Stumper....big tire trucks have always been part of the scene around here but the largest tire I've ever run were 12.50-33's on a 1 ton D300 Club Cab. I went through a number of different set ups over the years but found the 3" lift with 35-36" tires to be about the best compromise for street / off road use in a full size truck. The first set of big tires I recall buying were 12.00 BFG All Terrain Radials - absolutely worthless in mud of snow. They loaded up in either and became big fat slicks. Also ran some Monster Mudders and swampers which were pretty good in mud but they wear down super fast. After trying many different types of tires I settled on the Ground Hawgs (which I don't even know if they still make them) and had them on several trucks over the years. Most really agressive tires wear down really fast on the road which the Hawgs don't and the tread pattern was about the best I could find for mud - or even deep snow (emphasis on deep). One of the learnings early on is that big tires are about the worse thing going for snow or ice - unless you are trying to plow through 3-4 feet of it. My current truck I bought new in 1994 and is the only one that I left stock and didn't put big tires on or lift it up since my lifestyle and interests had changed. these were taken about last february I think I'll take some more today. Believe it or not for a 79 the bed is sound! only a little rust over the tires, even has an authentic bullet hole near the left tail lamp! I gotta straighten out the LF fender liner, the 12.5x35's caught it once and bent it pretty good, might get to that today also. It's just an old farm truck beater for me to get outta being housebound for days at a time due to lots snow over the winter and maybe pulling stuck in the mud cows loose sometimes too. The Ramcharger is now actually road reliable too so it will help in the winter too. Last edited by hemisatellite; 11-03-2011, 04:33 PM. Looks like it will be a fun truck. It always seems that most of you have way more bunches of money to spend on toys than I do, that's why I never posted a build forum. Ya'll got me started on a thread and I'll keep to it, even tho next to ya'll, mine will be boring to most of you. Um have you seen my d50 project? Talk bout low buck.........these are truck from our past that we show off when we get the chance......I'll never have another I can tell you that cuz I just cant afford it. I'm in the same boat at Ronny.....my newest daily driver is 12 years old new....not that I bought new cars all the time because I didn't but I pride myself for never being deep in debt until the last few years and well, I don't see me climbing out of the hole my kids put me in but then again, I could have said no to them. I do now tho! Sorry if I stole your post.. Wasn't my intention to one up you or mine is better type...I saw an read a few others posting what they built and just thought I would join in.. I am gonna deleat mine but if you decide to go with 2 1/2 running gear and tractor tires..give me a shout if you run into a problem and can't get it figured out..I have plenty of spare parts left over that can help with steering and suspension.. I AGAIN waited for all my help today, they finally all showed up loaded around 5 or so. By then, I already had the transfer case all lined up and about to go togethr/. I kinda took a slack day, I shouldn't have because the local Agri-Partners Coop want to talk to me at 10 am tomorrow. Do mosta my business there, could have big advantages being empoyed there too. Post it up Curt! Looks like it will go through just about anything.